While many analysts have been writing countless research reports in recent weeks defending the practice of stock repurchases, which as "the most important trader on Wall Street" recently explained was illegal until 1982 due to "market manipulation" concerns, the truth - much to the chagrin of banks like Goldman which has written no less than three report in the past month defending stock buybacks against a legislative onslaught that seeks to curb or ban outright corporate repurchase, the truth is that while buying back stock is great for shareholders and company executives as it boosts a company’s earnings per share and increases the value of the holdings of shareholders, including insiders whose compensation is frequently linked to stock return, stock repurchases do little if anything for the economy, especially when compared with other potential uses of that money, including hiring more workers. Overall, US companies ended up saving 30% in tax expenses overall in 2018, according to ITEP, and as we have reported on numerous prior occasions and Bloomberg noted over the weekend, "Tech companies were the main beneficiaries of the cash repatriation provision." Before the law, the largest overseas cash hoards among U.S. companies were held by Apple, Microsoft Corp., Cisco Systems Inc., Oracle Corp. and Alphabet. 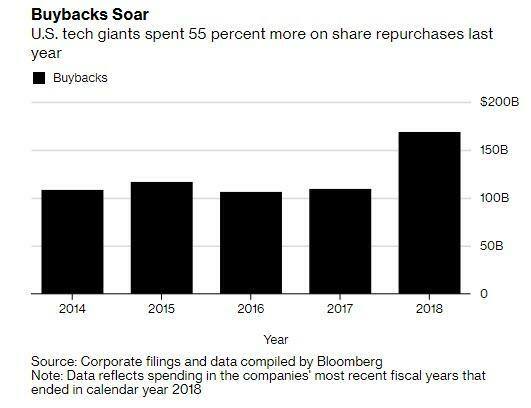 It is these companies that in the past year unleashed a historic buyback spree the likes of which have never before been seen. The verdict, at least according to Bloomberg, is that "the U.S. has given up hundreds of billions of dollars in corporate tax revenue for the promise of other benefits." Worse, buybacks - many of them funded with debt that yield-starved investors have no choice but to buy - pick up where the Fed's own middle-class crushing policies end: "Buybacks are one factor driving economic inequality in the U.S., as top corporate executives tend to benefit disproportionately from them,’’ David Santschi, director of liquidity research at TrimTabs, wrote in a recent report, reiterating a point which sends defends of stock buybacks into an apoplectic frenzy. To be fair, not all the tax savings were transferred into investors' pockets: spending on R&D climbed slightly, while capital expenditures rose because Alphabet and Facebook almost doubled spending in that category. On the other hand, Apple and its peers "have yet to bring manufacturing back to the U.S., as President Donald Trump had hoped." 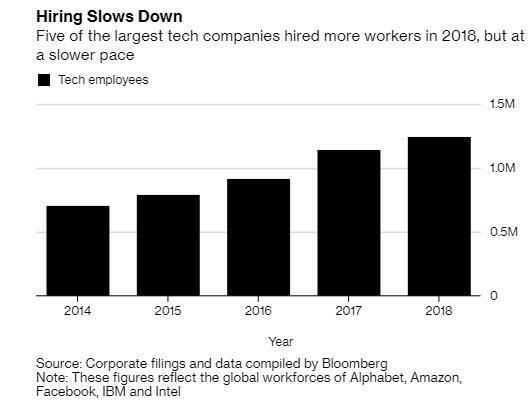 And, most importantly, there was no surge in tech hiring. As Bloomberg notes, while it is still too soon to measure the full consequences of the law, "there are signs it will miss the stated goals." Here's what we do know about corporate cash use in the past year. Things were less dire in other spending categories: research and development spending by the 10 tech companies rose 17% last year, a slight uptick from the 15 percent increase in 2017. Even so, the acceleration was mostly driven by just two companies - Alphabet and Amazon - which have invested heavily in cloud computing. 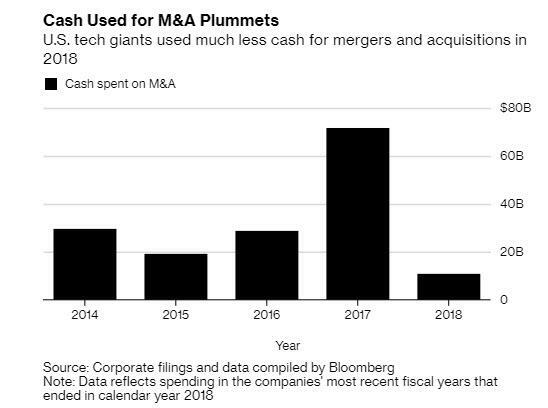 With buyback spending generating the highest and quickest IRR for management teams, it is no wonder that spending on M&A - much of which had been driven by the desire to create tax-safe offshore shelters via reverse mergers - tumbled, and after swelling in 2017, the amount of cash tech giants used for mergers and acquisitions collapsed in 2018. 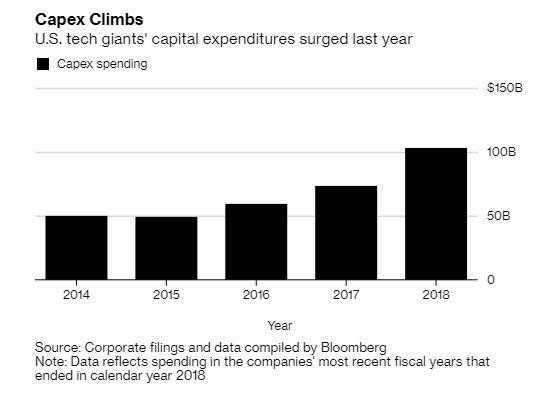 Finally, the all important "other" category, namely capital expenditures, did surge in 2018, but once again largely to just two companies as Alphabet and Facebook nearly doubled their Capex spending, which includes computers for their huge data centers. That helped boost the overall metric to 40 percent growth, from 23 percent the year before. Fast forward 12 years, when the largest US companies lied.... again. Oracle also lobbied hard for the tax law.... and since then the software maker has since poured cash into stock buybacks and dividends – recently giving the go-ahead to repurchase about $10 billion of shares each quarter. Putting this in contast, in previous years, the company authorized share repurchases of more than $10 billion about once a year. This not only boosted the stock price, but helped concentrate the ownership of company co-founder Larry Ellison. What about the world's most valuable company? So while US workers got the short end of that particular deal, one can still argue that the megatech names did boost the economy: after all in a world in which "the S&P500 is the economy", the hundreds of billions the tech industry spent to repurchase their own shares and push their stocks to all time highs "helped" bolster the impression, or rather illusion, that just because the Nasdaq (and S&P) is at all time highs, the economy must be healthy too. Nothing could be further from the truth, as the inevitable end of the buybacks spree will soon demonstrate.